Animated features win awards for best screenplay just like this one. It all starts with great Screen Writing Competitions. Frozen revolves around Elsa, the Princess of Arendelle, who possesses the power to manipulate ice, frost, and snow. 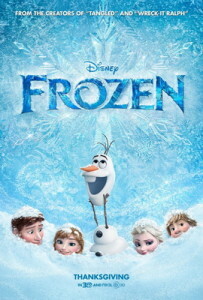 An incident that injures her younger sister, Anna, causes her parents ask for the trolls’ help in removing Anna’s memories of the accident and Elsa’s powers. The family continue living in isolation inside the castle, hoping that the time will come when Elsa will be able to fully control her powers. Growing up, Elsa spends most of her time being alone because she is too afraid to hurt Anna again. After a few years, the girls’ parents die at the sea in the midst of a storm. The time comes when Elsa reaches the right age to be the kingdom’s new queen. During the coronation night, the Duke of Weselton comes as one of the guests. Prince Hans also comes who meets Princess Anna. Elsa’s coronation pushes through and before the night ends Prince Hans proposes to Anna. When Elsa learns of this, she opposes their engagement. The two sisters start arguing with each other that leads to Elsa’s emotional outburst causing the manifestation of her powers. Because of what she has done, Elsa leaves the castle immediately and accidentally causing winter on the entire kingdom. She flees to the mountains where she builds herself an ice castle, determined never to return to her former home. Meanwhile, Anna sets on the task of looking for Elsa. She leaves the kingdom on Hans’ hands and meets an iceman called Kristoff and his reindeer, Sven, along the way. The group meet Olaf, a living snowman created by Elsa unknowingly. Anna finds Elsa but Elsa is still afraid the she might hurt her sister. Elsa strongly insists that Anna must return to their kingdom. When Anna refuses, Elsa almost assaults Anna with her powers. Elsa becomes more agitated and she creates a giant ice creature just to force Anna and her friends out of her castle. During their escape, a flock of Anna’s hair starts turning white. Because of this, Kristoff brings the group to the trolls and asks for their help. He learns that Anna’s heart has been frozen and only an act of true love can cure her. Immediately, Kristoff sets on bringing Anna back home so that Hans can kiss her and break Elsa’s curse. However, Hans is also in search for Elsa. When he finds her in her castle, he brings her back and imprisons her in Arendelle. Elsa wakes up inside the castle again and Hans asks her to undo what she has done to the kingdom. Unfortunately, Elsa does not know how to lift the winter climate that she has incurred. Anna arrives and begs Hans to kiss her. Hans refuses and confesses that he only wants to marry her because he want to possess the entirety of Arendelle. Hans leaves Anna behind and sets in motion a conspiracy accusing Elsa of her sister’s death. Elsa manages to escape into the blizzard while Olaf finds Anna and tells her that it is Kristoff who is really in love with her. Realizing her true feelings for Kristoff, Anna goes out with Olaf to find him. Hans lays his hands on Elsa and charges her with Anna’s supposedly death. Grief comes to Elsa and her emotions calm the snow storm down. Kristoff and Anna find each other but when Anna sees that Hans is about to kill her sister, she throws herself to catch the deadly blow while her body begins to freeze all over. As Elsa starts to cry for her frozen sister, Anna’s body begins to thaw. It turns out that her sacrifice is an act of true love. Realizing that love can be used to control her powers, Elsa starts removing ice covering the entire kingdom. The movie ends with Elsa reigning again in the kingdom and living happily with her sister.